AN ECONOMIST yesterday challenged the widespread notion that foreign workers depress wages, sparking further debate on Singapore's already contentious immigration policies. Nanyang Technological University (NTU) don Ng Yew-Kwang argued that it was a common fallacy that foreign labour is bad for locals as it reduces per-capita resources, and hence reduces per-capita incomes. Speaking at a forum on the Population White Paper, the Albert Winsemius Chair Professor at the university's division of economics said the higher demand actually pushes up prices of things owned by locals, including property. But the argument was rejected quickly by Economic Society of Singapore (ESS) vice-president Yeoh Lam Keong, one of six other panellists who gave speeches at the society's event at Orchard Hotel. Mr Yeoh trotted out figures to show how the wages of Singapore's bottom 20 per cent had fallen by about 10 per cent in real terms from 1997 to 2010, while incomes for the top 20 per cent had grown by about 30 per cent. "Excessive import of unskilled foreign labour has dampened and suppressed the real wages of the working class in Singapore," he said. 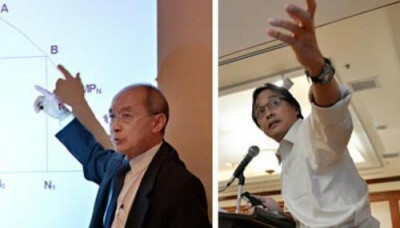 Professor Ng later clarified his point, saying that it was possible that the influx of unskilled workers may press down wages. But since there are foreigners willing to work in Singapore at current wage levels, it would not make sense to close the door to them. Mr Yeoh, however, pointed out that there are also threats to social cohesion to consider. Pointing out that Singapore accepts about 30,000 new permanent residents annually, he said this is about 75 per cent of the school-going population. The equivalent figure in the United States is 2 per cent. "The rate of assimilation of a foreign culture we are expected to absorb in Singapore has never been attempted in any other developed country," he said. "Anecdotally, you can see that it is already straining social cohesion and national identity." Another panellist, Nominated Member of Parliament Laurence Lien, warned that dwindling wages caused by cheap foreign labour will harm a worker's psyche, even with a system to redistribute wealth to the poor. "You are killing the self-confidence and esteem of that worker." Prof Ng had put forward his argument on immigration and wages as among the fallacies the strong negative reaction to the White Paper was based on. Another was that congestion and pollution can be blamed on a higher population. He argued that a larger population means more buses and wider roads, with increased investment on transport. "Given the per capita investment... if the population size is halved, then the road size will be roughly halved. Had we not increased, then we won't have so many MRT routes and high bus frequencies." Other panellists focused on the White Paper's assumptions, including the fear of a heavier burden as fewer workers will support a growing group of elderly people, if the number of workers is not topped up. ESS vice-president Manu Bhaskaran and NTU assistant professor Walter Theseira argued that the elderly may have saved enough in their Central Provident Fund accounts to be able to support themselves. Psychology professor David Chan said they may also be more educated and live longer, and should be seen as a resource. But Dr Thia Jang Ping from the Ministry of Trade and Industry cautioned against an overly optimistic reading. The director of the ministry's economics division argued that the elderly will demand services in their golden years, and paying more for these services will erode their nest egg.